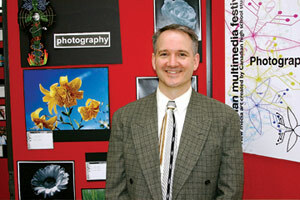 Award-winning teacher at Marshal McLuhan Catholic Secondary School inspires students to explore the world of new media. "Several years ago I was with a group of art students in New York City," recounts Toronto teacher John D'Arcy. "While visiting the major art galleries I was devastated to see them spend no more than 30 seconds in front of great masterpieces. In St. John the Divine, a stunning Gothic cathedral, we came across a contemporary art display - a video installation on life and death by artist Bill Viola. The kids were completely mesmerized, riveted by the images, and it suddenly occurred to me what we have known for centuries. Contemporary artists use contemporary tools to tell their stories," explains D'Arcy. "We saw this with cave paintings and with stone carvers; the Impressionists were inspired by new discoveries in optics and colour theory, and some of Degas's most dynamic paintings were derived from photographs, which was new technology at the time. Today's kids are turned on by technology and new media, and if we want to fully engage them in art, we have to embrace these modern tools." "Contemporary artists need contemporary tools to tell their stories." In 1999, after visiting other schools' art shows, D'Arcy and his students at Marshal McLuhan Catholic Secondary School in the Toronto Catholic District School Board decided to put on their own show, but they wanted it to be different. Considering their school's mandate of integrating technology into the curriculum and wanting to showcase new media in a forum that included students from other schools and members of the new-media industry, they launched the McLuhan MultiMedia Festival (M3F) with 57 submissions from across Toronto. By 2004, M3F had become an award-winning national festival with over 1,000 submissions in nine categories. Festival organizers envision a future with new-media student artists and teachers from around the globe submitting art and coming to Toronto to participate in a week-long symposium, exploring issues like the effects of globalization on art, technology, education and storytelling. D'Arcy explains, "Our goal is to contribute to the creation of a peaceful and informed global village." Student teams at Marshal McLuhan Catholic Secondary School prepare for M3F 2005. D'Arcy emphasizes that the festival is not about winning, although 40 new-media professionals and sponsors judge the artwork and award prizes to the top three entries in each category. "Competition is not the most important aspect. The festival is about sharing and celebrating new and best practices. It's about encouraging young artists to creatively embrace technology. It's about giving them a voice." This year his students decided to make a special effort to include First Nations and francophone student artists in the festival. Founded by students working in various courses, the M3F is currently organized and run by a mixed group of five McLuhan CSS staff members and 70 students. The growth of the M3F has led to the development of an interdisciplinary course where students are taught leadership and project-management skills and then use these skills to advance whatever section of the festival they feel best suits their interests and abilities. D'Arcy explains: "Students in the leadership class may not all have an interest in art, but they do value being involved in organizing and managing such a large project. Moreover, there's an important and engaging cross-discipline nature to this course, because students have to be articulate on the phone, write compelling letters, raise and track funds, create and use databases and be reliable, organized and motivated self-starters. We're developing and sharpening life skills here." "We need to find avenues, like M3F, to celebrate our diversity. This is how we will become a humane global village." Partnering with business is a major element of the festival's success, and D'Arcy hopes to secure not-for-profit charity status. "The money helps us organize and promote ourselves, but more importantly, it allows us to run a professional festival." One of his goals is to create scholarships for needy students to pursue new-media studies at postsecondary institutions. D'Arcy's philosophy of education is simple yet not always easy to achieve. "I believe in trust and in creating opportunities for kids to shine. There's no need to control them; what happens, happens." Likening his classroom to society, he explains that while it's challenging to hear all the diverse voices, he encourages his students to focus on their unifying goal of sharing and promoting a love of art and new media, both of which are constantly filtered through Marshall McLuhan's teachings about society and technology. "I try to model compassion and reason and to never be adversarial. I teach students to slow down and listen to each other, to respect one another and to build on what they have in common, because focusing on what makes them different makes them disagree, and then we'll never move forward. I think it is important to go beyond merely accepting or understanding our differences; we need to find avenues, like M3F, to celebrate our diversity. This is how we will become a humane global village." John D'Arcy at M3F 2004. D'Arcy credits students with doing much of the work, but acknowledges that the festival could not happen without the significant contributions of his colleagues and administrators. Teachers Teresa Kelly, Cheryl Madeira and Sandra Mustacato and child/youth worker Vickie West are part of the collaborative team that mentors, inspires and cares for the students. As well, he credits his principal, Anna Convertini, and superintendent Mark Fenwick as huge supporters. "Anna often says 'anything you want, John,' although she says it with a wry smile. She trusts me and I trust my students. There's no way we'd ever let anyone down." D'Arcy acknowledges that it takes a great deal of extra time to teach the way he does; it's not something he can do inside the traditional classroom and day. He gently yet earnestly explains: "This is my vocation; it's not just a job. This is my contribution to society, to our planet. It's what I do." What lucky students at Marshal McLuhan Catholic Secondary School. M3F hopes to expand its organizing team with sub-committees in classrooms across Canada. These groups will be managed via web forums and video conferencing. To inquire or get involved, e-mail darcy@m3f.org. In 2004 John D'Arcy received a Technology Innovation Award from the Learning Partnership (TLP) for M3F. The Technology Innovation Award showcases the achievements of educators at Ontario's publicly funded schools, colleges and universities whose innovative approaches help build modern learning environments. Projects focus on the use of technology, blended learning environments, knowledge transfer, organizational learning, professional development and/or the needs of special education students. For past winners and video clips about their award-winning programming or to nominate other innovative educators, visit www.thelearningpartnership.ca. The McLuhan MultiMedia Festival is both a virtual and an actual festival. The virtual festival exists online at www.m3f.org, where submissions are displayed, discussion forums create networks of people, and student and teacher resources are available. At the actual festival, participants meet at the Ontario Science Centre in May to celebrate the art and forge new relationships. The four-day event will include workshops and seminars as well as the display of students' artwork submitted between January and April. It provides students with an opportunity to network with other new-media artists and professionals. Submission categories include animation, photography, image manipulation, desktop publishing, interactive media, video, illustration, audio and fusion - a new category for projects using three or more media. As new media evolves, the categories will no doubt change. In attendance you will find students, teachers and education officials from secondary schools in Ontario and Quebec, as well as representatives from new-media postsecondary programs, sponsors and industry. The festival concludes with the M3F gala event honouring the winners. The second annual train-the-trainers symposium took place this year in February at Centennial College's Centre for Creative Communications. Over one hundred secondary school teachers from around the province attended in 2004, and teachers outside of the arts and technology subject areas were especially encouraged to attend. New-media professionals and postsecondary educators offered interactive and hands-on workshops, and the day proved to be a valuable learning experience. For more information on the McLuhan MultiMedia Festival, including how to submit artwork or view submissions, visit www.m3f.org.